Approximately 70 to 75 percent of initial Social Security Disability (SSD) claims are denied. If your claim has been denied, it is important to remember that you have appeal rights. At Osterhout Berger Disability Law, we can explain those rights and help you determine your options for pursuing an appeal. To schedule a free consultation with a Social Security Disability appeals lawyer, fill out our intake form or call 412-794-8003 (locally in the Pittsburgh area) or toll free at 1-866-438-8773 (outside the Pittsburgh calling area). If your initial SSD claim has been denied, it is advisable to work with an attorney during the appeals process. The appeals process can be confusing, complex, and lengthy. Legal advocacy from an experienced attorney can make a significant difference in the final outcome of your case. Our law firm has handled more than 30,000 Social Security Disability claims over the past two decades. Chances are, we have handled a case similar to yours. We can represent you in all stages of the SSD appeals process, including reconsideration, the administrative law judge (ALJ) hearing, before the appeals council, and in federal court. What if a Judge Has Already Denied My Claim? Has your SSD claim been denied? It is important to remember that the vast majority of initial claims are denied. At this point, you may want to consider seeking an appeal. When you are looking for an attorney for legal help, you should look at his or her track record of appealing unfavorable administrative law judge (ALJ) decisions. At Osterhout Berger Disability Law, we appeal at least 90 percent of these unfavorable decisions, because when we present the case to the judge initially it is because we believe in the client and are committed for the long haul. To discuss your denied claim, we recommend scheduling a free consultation with a SSD lawyer by calling us at 412-794-8003 (locally in the Pittsburgh area) or toll free at 1-866-438-8773 (outside the Pittsburgh calling area). 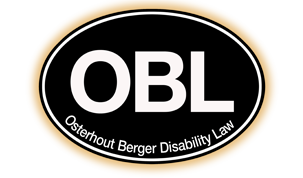 Osterhout Berger Disability Law represents disabled individuals. Our attorneys and staff provide clients with the benefit of over 50 years of combined experience and the knowledge gained through handling over 30,000 Social Security Disability claims. When preparing a case for hearing, we always have in mind the most recent case decisions of the federal courts, which have exposed errors ALJs frequently make when denying benefits. We say that our job is to win the case but, if we can’t, we make sure we can show where the ALJ made mistakes so that an appeal is more likely to be successful. The first level of appeal after an ALJ denies the claim is to the Appeals Council. Essentially, the Appeals Council is the Social Security appeals court and is the last appeal available within the Social Security Administration. The appeal to the Appeals Council must be filed within 65 days after the date the ALJ denied the claim. The appeal is made on a simple form and, while written arguments are permitted, they are not required. An appeal can be filed by contacting the local Social Security office (local office locator) or may be filed online (contact SSA) or via fax (703.605.8021). Appeal decisions from the Appeals Council take anywhere from several months to, in some cases, several years, and are unfavorable decisions more than 80 percent of the time. Although the fact that the Appeals Council denies appeals so often may sound discouraging, the good news is that the federal district courts take very seriously their responsibility to review the decisions of the Social Security ALJs. A federal court complaint can be filed only after the Appeals Council denies benefits, within 65 days of the date of the Appeals Council denial. In southwestern Pennsylvania and the surrounding area, this can be done in person by filing the paperwork at the federal courthouse, or by mailing it there (in Pittsburgh and Johnstown, as well as Wheeling, West Virginia, and Columbus, Ohio), and Wheeling and Columbus offer the option of filing electronically. In any appeal, whether it is to the Appeals Council or to the federal district court, there are some things that need to be kept in mind. First, an appeal is not another attempt to prove that the claimant is disabled; rather, it is an attempt to prove that the ALJ committed significant errors in saying that the claimant was not disabled. While this sounds like the same thing, it isn’t. For instance, an appeal does not involve any additional hearings where the claimant testifies or describes his or her medical problems, and except in exceptional circumstances, new medical evidence cannot be submitted to the Appeals Council or to a federal district court. Rather, the claimant must show in any appeal that the ALJ’s decision is flawed based upon the evidence that was in the file at the time of the decision. Evidence that the claimant’s medical condition has worsened, or evidence of a new medical condition that did not exist when the ALJ made the decision, would not be accepted in an appeal. However, evidence that could not be obtained prior to the ALJ’s decision might be allowed, but only if the court finds that the evidence is “material” (which means: would have, in all likelihood, changed the outcome of the case). We are particularly committed to excellence in our presentation to the federal court appeals of unfavorable Social Security ALJ decisions. Please feel free to review a list of the most recently decided federal court appeal cases in which we have been involved in and view, if you would like, a sample of some of the briefs we have prepared on behalf of our clients in federal district court. As you review this material, please note that many of the cases described in the federal court summary were cases that were referred to us by other attorneys, making us the “lawyer’s lawyer” in the area of Social Security federal court appeals. Schedule a free confidential consultation about your Appeals Council or federal court appeal by calling us locally at 412-794-8003 (locally in the Pittsburgh area) or toll free at 1-866-438-8773 (outside the Pittsburgh calling area). If you prefer, you can fill out our intake form, and an experienced lawyer will contact you to schedule an appointment.